The official sign. Photo taken by Flickr user Iwona Erskine-Kellie. 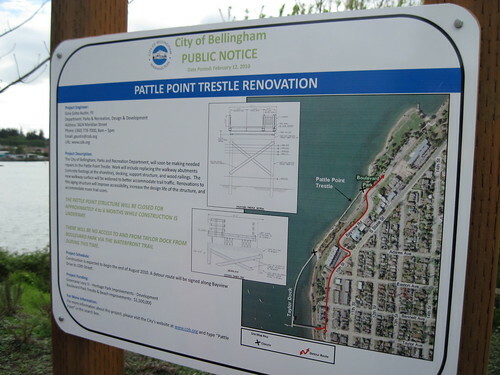 Just a FYI, the Pattle Point Trestle at Boulevard Park will be closed starting today (Oct 4, 2010) for a complete overhaul. The 541-foot-long wooden walkway that connects Boulevard Park and Taylor Dock will be replaced to look more like the Taylor Dock promenade- wider and made of concrete. This will be a great improvement in my opinion because there was always a bottleneck on the Trestle (or in my mind, “the little wooden part of the walkway”). The sign states that construction will take 4 to 6 months, and there will be no access to and from Taylor Dock from Boulevard Park via the waterfront trail during this time. A detour route will be clearly marked along Bay View Drive to 10th Street. For more information about this project, contact Project Engineer Gina Gobo Austin at 360-778-7000 or at gaustin@cob.org.